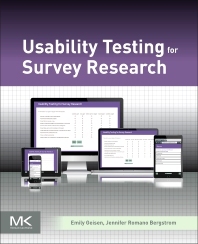 Usability Testing for Survey Research provides researchers with a guide to the tools necessary to evaluate, test, and modify surveys in an iterative method during the survey pretesting process. It includes examples that apply usability to any type of survey during any stage of development, along with tactics on how to tailor usability testing to meet budget and scheduling constraints. The book's authors distill their experience to provide tips on how usability testing can be applied to paper surveys, mixed-mode surveys, interviewer-administered tools, and additional products. Readers will gain an understanding of usability and usability testing and why it is needed for survey research, along with guidance on how to design and conduct usability tests, analyze and report findings, ideas for how to tailor usability testing to meet budget and schedule constraints, and new knowledge on how to apply usability testing to other survey-related products, such as project websites and interviewer administered tools. Emily Geisen is the manager of RTI’s cognitive/usability laboratory and specializes in designing and evaluating survey instruments to improve data quality and reduce respondent burden. In addition, Ms. Geisen teaches a graduate course on Questionnaire Design at the University of North Carolina (UNC), Chapel Hill. In her tenure at RTI, she had conducted hundreds of usability tests on a variety of projects from the Survey of Graduate Students and Postdoctorates to the 2020 Census questionnaires. She was the 2010 conference chair for the Southern Association for Public Opinion Research (SAPOR) and the 2009–2011 secretary of the Survey Research Methods Section of the American Statistical Association. She is the 2016-18 American Association for Public Opinion Research (AAPOR) Membership and Chapter Relations Communications sub-chair. Ms. Geisen developed a short course on Usability Testing for Survey Researchers that was taught at the 2011 annual SAPOR conference; the 2016 AAPOR annual conference; the 2016 International Conference on Questionnaire, Design, Development, Evaluation and Testing; and UNC’s Odum Institute. Ms. Geisen also teaches an Introduction to Focus Groups course at the Odum Institute. Ms. Geisen received her B.A. in Psychology and Statistics at Mount Holyoke College, and received her M.S. in Survey Methodology in 2004 from the University of Michigan’s Program in Survey Methodology where she was an Angus Campbell fellow. While attending the University of Michigan, she also worked at the Institute for Social Research. Jennifer Romano Bergstrom has over a decade of experience planning, conducting and managing user-centered research projects. At Facebook, she leads user experience (UX) research for Privacy and Safety Check (prior: Facebook Lite; Videos). She leads, conducts, and manages UX studies across multiple teams simultaneously and collaborates across disciplines to understand the user experience. Jen specializes in experimental design, implicit learning, and eye tracking. Jen co-authored Eye Tracking in User Experience Design (Elsevier, 2014) and has published peer-reviewed articles in Applied Cognitive Psychology, Memory, Annals of the New York Academy of Sciences, Journal of Health Communication, Computers in Human Behavior, Survey Practice, International Journal of Human-Computer Interaction, Social Science Computer Review, Universal Access in the Information Society, and Journal of Usability Studies. Jen frequently presents research and conducts workshops at local, national, and international events and conferences. Prior to Facebook, Jen formed the UX Division at Fors Marsh Group (FMG), in the Washington DC area, where she designed a state-of-the-art laboratory and recruited, trained, and led a team of UX researchers. Prior to FMG, Jen taught a team of researchers at the US Census Bureau how to use eye-tracking data in usability research to impact design change for website, surveys, and forms. Jen teaches UX Design and Research courses for government agencies, practitioners, and academia. She is the President of the User Experience Professionals Association, and she is past President of the DC Chapter of the Usability Professionals Association and the DC Chapter of the American Association for Public Opinion Research. Jen received her B.A. in Psychology from Central Connecticut State University, and her M.A. and Ph.D. in Applied/Experimental Psychology from The Catholic University of America.